LHR Marine believe that our clients safety needs do not end when they purchase our products. We offer a turnkey consultancy style service that ranges from identifying the correct safety products to an after sales service which aims to ensure that our products are effective and that any problems are resolved quickly. For example, LHR Marine offer an excellent Working at Height consultancy service and have recently entered into a global agreement with a major subsea shipping company regarding this. Every fall arrest system application is unique and has its own difficulties and challenges to overcome. Our comprehensive range of products, systems and experience can meet the requirements of the most challenging environments. LHR Marine offers a huge range of Working at Height products and systems that address the demands imposed by unusual structures or extreme conditions. 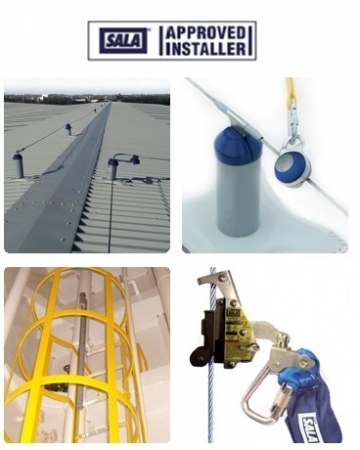 This ensures that employees are protected whilst staying within the ever changing Working at Height legislation. LHR Marine will work with you to help define the most suitable fall arrest solution for your needs and our experienced personnel will oversee every aspect of the project to ensure that the system meets all the technical and safety criteria. Our highly trained and competent personnel can even install many of our products on and offshore if required. The photographs on the right side of the page show a couple of examples of LHR Marine Working at Height installations. Above is the Evolution™ Horizontal Lifeline System installed on a rooftop of one of our clients. Below is the Lad-Saf® Vertical Lifeline System installed on one of our clients ladders.